When you mount a musical, you needn’t slavishly follow a Broadway’s production’s template. In fact, some of the best subsequent productions of musicals have varied widely from the Broadway originals. All the lines and songs have been kept precisely in place, of course, but the director’s vision may have been wildly different – sometimes worse, sometimes better – than the original. The irony is that seeing the initial production of a Broadway musical just might paradoxically inspire you to have new ideas on how to mount it at your theater. Many have been helped by watching the video reproductions of Sweeney Todd, Sunday In The Park With George and Into The Woods. Now we have a new video recording of another Broadway musical: Shrek. It was taped on the stage of the Broadway Theatre where it played for more than a year, shortly before it closed in 2010. The title character is, of course, the green ogre whose lovely nature turned nasty because people mocked him for the way he looked and spurned him without giving him a chance. As a result, quite a bit of time must pass before he can believe and trust the Donkey who has been saying all along that he wants to be his buddy. And if friendship is hard for Shrek to achieve, imagine how difficult a time he has in daring to proclaim his love for the beautiful (or so he thinks) Princess Fiona. Shrek was certainly lucky that he didn’t fall prey to the evil Lord Farquaad. If the so-called noble tortured a little defenseless Gingerbread Man, imagine what he’d do to an ogre – especially one who loved the same princess that he coveted. Of course, the not-so-good Lord did have troubles of his own. 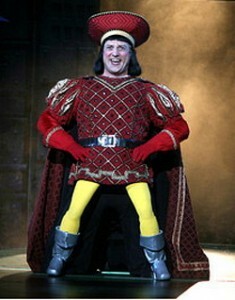 As was the case in the original Academy Award-winning animated film, Farquaad was established as terribly short. Bookwriter-lyricist David Lindsay-Abaire, composer Jeanine Tesori and director Jason Moore decided to keep that concept. So what to do? Hire a vertically challenged actor? Or should they keep their thinking caps on in hopes of finding another solution? It’s a good question for you, too. And if you missed Shrek's original Broadway production, you can now see via the video how the collaborators and Christopher Sieber, the actor cast as Farquaad, handled it. In a phone interview, Sieber told me that that the solution wasn’t readily apparent. “And I was with the show from close to the beginning,” he reported. “During the time I was in London doing Monty Python’s Spamalot, I got a call from my friend Jason Moore,” he said, citing the director who got on the theatrical map for beautifully staging Avenue Q. And indeed it was. Sieber wore a little – well, shall we say, skirt – of black on which images of teensy little legs were sewn. Of course Sieber soon discovered that there was a profound difference between taking a few baby steps in a rehearsal hall and appearing in scene after scene after scene on a vast Broadway stage that took substantially longer and far more knee power to cross. To be fair, the difference between your production and the one in which Sieber appeared is that he did the entire 441-performance run. While we’d all like to think that your production of Shrek would run as long, we must be real – and your Lord Farquaad must be grateful. So if Sieber had it to do it over again, would he have elected to take another easier job – such as mining coal, emptying dumpsters or fishing for crabs in Alaska? Costume designers at your theater, take note! All right, but there’s a good chance that the performer you choose to play Donkey will be grateful for the chance. 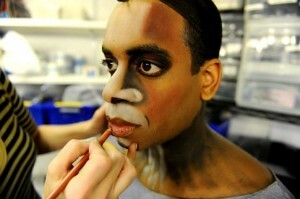 At a recent party, I asked Daniel Breaker, who played the role in the Broadway production, what he remembered. By the way, even if you don’t feel inclined to play Lord Farquaad or Donkey or have no goals in directing or designing Shrek, the video is a pleasure for its own sake. It might very well make a great holiday present for any friend, relative, colleague – or yourself. 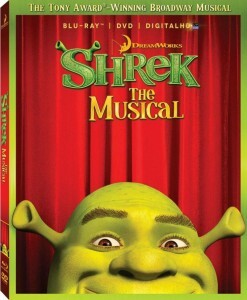 Part of the reason is the story itself: it has heart and soul, as do the performances, not only from Sieber and Breaker, but also from Brian d’Arcy James as the aggressive and then passive Shrek; Sutton Foster as the nice-but-occasionally snarky Princess Fiona; and John Tartaglia as Pinocchio. When the show opened in 2008, DreamWorks set the record for the most money ever spent on a Broadway musical – a reported $25 million. One can easily see in this video where the money went. Granted, Shrek was later eclipsed as the most expensive Broadway musical ever by another show, but it still holds the record as the most expensive Broadway musical to incur no serious injuries. You may e-mail Peter at pfilichia@aol.com. Check out his weekly column each Tuesday at www.masterworksbroadway.com and each Friday at www.kritzerland.com. 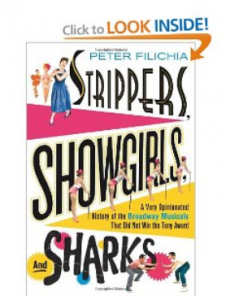 His new book, Strippers, Showgirls, and Sharks – a Very Opinionated History of the Broadway Musicals That Did Not Win the Tony Award is now available at www.amazon.com.